Articles > Enjoy > Burned out? No big deal! Burned out? No big deal! All too often when bulbs in our apartments get burned out, we throw them away without a second thought: what’s the use of it now? But add a dab of imagination – and “properly made” hands can work miracles. If you have a child, then a burned out illumination tool may turn into a wonderful handmade toy. Therefore fill empty space of the “small Sun” with sea sand, shells, plastic plants and place a tiny crocodile inside. 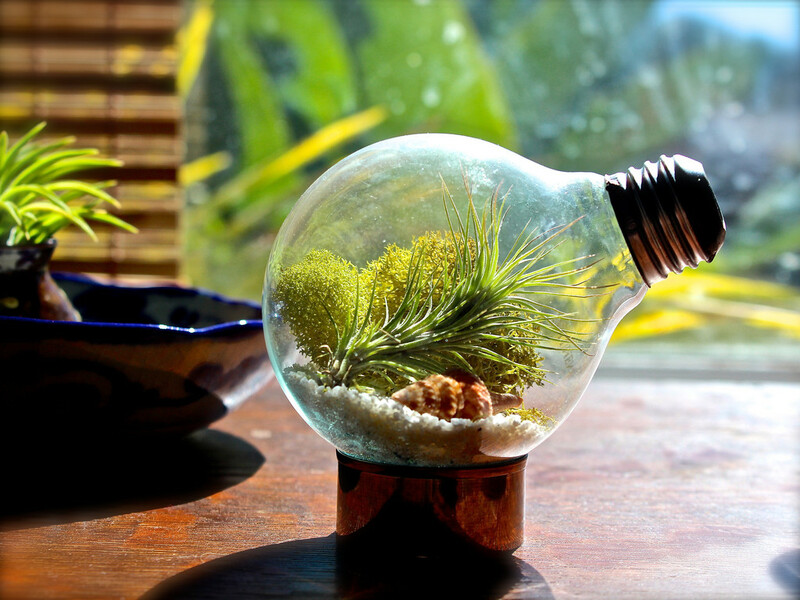 Sign on reception: you’ve created mini-terrarium for children’s room and it is sure to delight the eye of your dear ones. Awaiting warm days for a gathering with friends in a country house, aren’t you? It’s about time you started collecting bulbs because they can shape beautiful garden decorations. It is enough to color them with coldish and silverfish paint and hang among leaves. Sparkling in the sun, such illuminations will turn ordinary trees into fairy decorations and then even charry BBQ and warm beer won’t be that annoying. On the other hand, in cold seasons burned out “luminaries” can make a whole flower bed at home. Affix them to window sill vertically bottom up, fill with water – ta da, you have creative vases that cannot be bought anywhere. For better stability it is suggested to make wire stands. By the way, on connecting a couple of such vases one can make a wonderful hanging string. So you say everything is unusual in your room anyway? Trust us, even in this case pears made of bulbs wouldn’t go amiss. In order to put such an exotic interior design into practice all you need is glue, twine and a small twig. Japanese craftsmen went to even greater length. 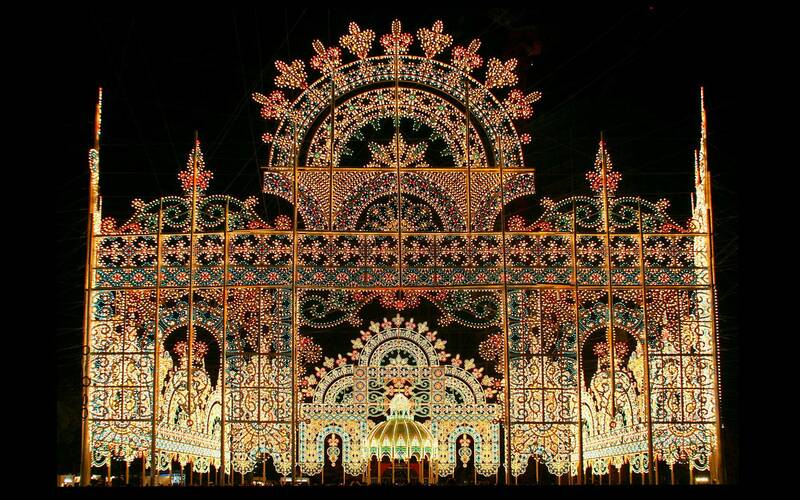 In the city of Kobe annual festival Kobe Luminarie is held where about 5 million people come to get an eyeful of wonder-architecture made of illumination. Speaking of which, these amazing constructions are also a tribute to the memory of 1995 earthquake victims when the city was plunged into darkness for long. And it is no big deal if you had to welcome this New Year with you grandma’s fairy lights and Chinese Christmas tree decorations. In compensation, you’ll approach the next one with bells on. Thank to bulbs, acrylic paint and creative mood one can easily make one of a kind ornamentation for the New Year’s tree. In order for ainted faces to last longer, spray it with aerosol car paint. So, when going to throw away another burned out “lighting bug”, better hold it over in case you’re eager to do some handiwork in your leisure time. We wish you inspiration and it is possible that in our next feature on amazing application of junk stuff from a closet we’ll tell about your crafts. P.S. Almost all our “recipes” require empty space inside bulbs. It isn’t hard to achieve at all if you’re armed with either nippers or pincers using which you carefully disconnect the bottom and take out the contents. For a perfect luster, it would be nice to give your “sunny” a wet wipe from inside. Done? Great, nothing will interfere with a flight of fancy now.